This amazing beef short ribs recipe is so easy to make with a couple of off-the-shelf additions. The honey-chili sauce combination is wonderful. Of course, everything tastes better with the addition of a few cloves of garlic! In a skillet, cook onions gently for about 5 minutes to soften them. Remove onions from the pan and place them in a large baking dish. Brown ribs in the skillet and season them with a bit of salt and pepper. Add browned ribs to the baking dish. Meanwhile, in a saucepan mix the honey, soy sauce, sweet and sour sauce, water, chili sauce and chopped garlic. Heat together for about 5 minutes. Pour over ribs in baking dish. Bake for about 45 minutes for short ribs, 1 1/4 hours if you are using back ribs. Baste often with the sauce. Keep the ribs covered for the first 1/2 hour, then bake uncovered. To make sure this recipe is gluten free (if you need that), check to make sure that all of the sauces you use are gluten free. This is an any season recipe, but obviously works best in those months you don’t mind having the oven on. This beef rib recipe becomes a tasty oven baked beef back ribs recipe simply by replacing the short ribs with back ribs and increasing the baking time as shown above. 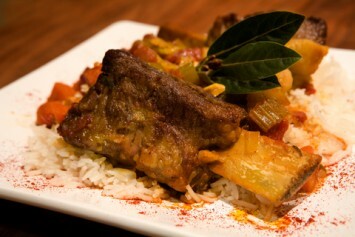 If you like this beef short ribs recipe, have a look at the rest of our terrific beef recipes.